The knee is one of the largest and most complex joints in the body. The knee joins the thigh bone (femur) to the shin bone (tibia). The fibula, smaller bone that runs alongside the tibia and the kneecap (patella) are the other bones that make-up the knee joint. Numerous bursae, fluid-filled sacs, help the knee move smoothly. 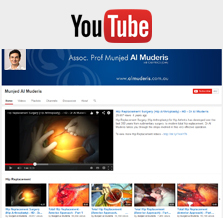 A/Prof Munjed Al Muderis has a special interest in ACL Reconstruction using anatomy preserving technology and Knee Replacement Surgery using computerised navigation technology. For more information or to book a consultation to assess whether surgery is right for you please contact A/Prof Al Muderis' office on 1800 907 905 or +61 2 8882 9011.